It’s been over three years since we’ve last highlighted CodeMaid, Need help cleaning up your code? CodeMaid to the rescue!. 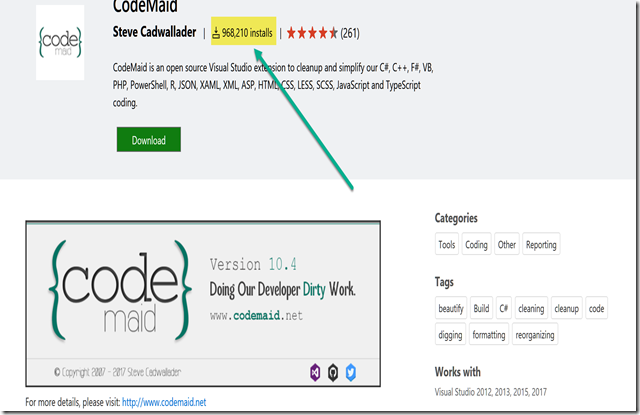 CodeMaid v10.4 is now available on the Visual Studio Marketplace and GitHub. This release focuses on some improvements to Visual Basic support courtesy of thehutman. Currently supports VS2012, VS2013, VS2015 and VS2017. For Visual Studio 2010, the last supported version is v0.8.1. For Visual Studio 2005/2008, the last supported version is v0.4.3. … yeah, it’s nearing 1 million installs. How cool is that?